Have I mentioned recently how hot it’s been?! Not that I am complaining…I LOVE when it is hot. I’ll take 90s/100s any day. However as much as I love it, the heat does take its toll on me including not wanting to cook anything major or eat anything heavy. 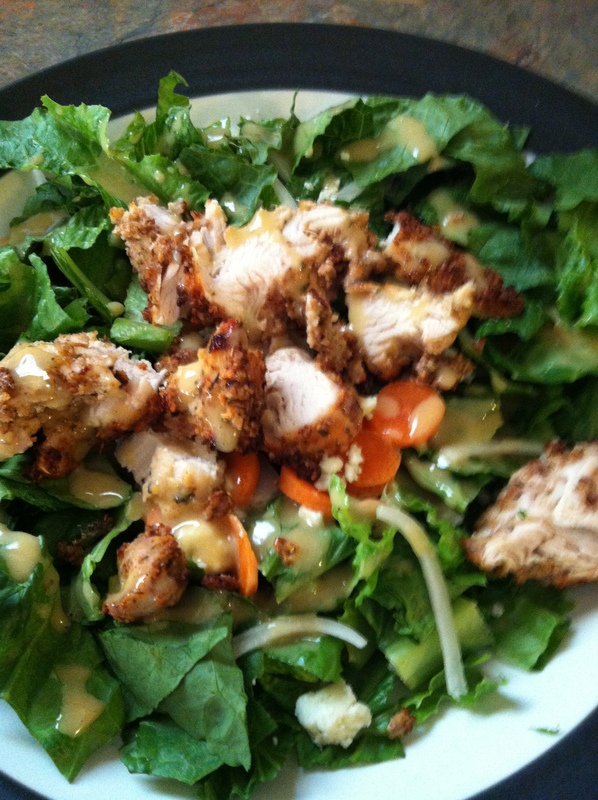 I found this recipe for Pecan Crusted Chicken Salad in Cuisine at Home Magazine and knew it would be perfect for dinner on a hot summer night. I make salad a lot for myself and occasionally for both Hubby and me, but sometimes grilled chicken on a bed of lettuce gets to be a little bit boring. This version with a pecan crusted chicken was a very nice change of pace. 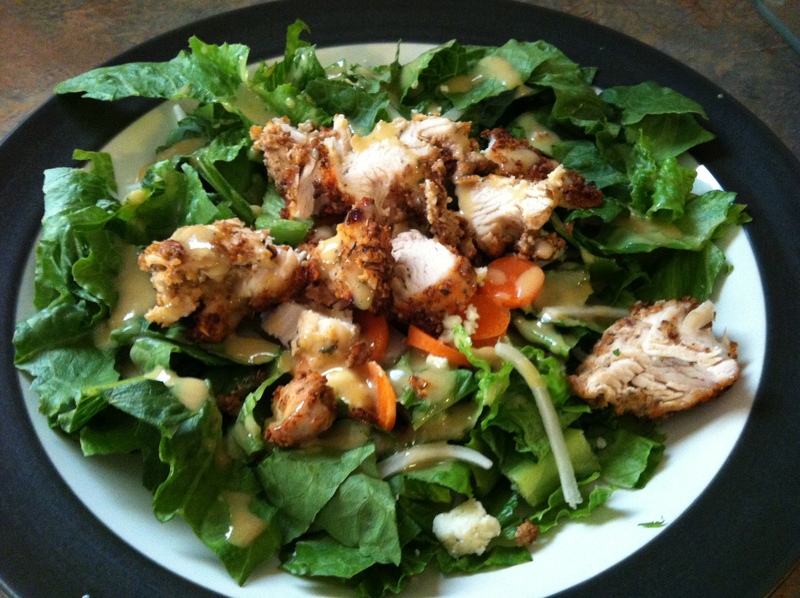 It was quick and easy to make and the dressing was delicious! For the dressing, I highly recommend using “raw honey”. It is a little bit more pricey than regular honey, but it tastes so much better and is better for you. You can usually find it at specialty stores or in the “organic/natural” section of most large chain grocery stores. You will get the most health benefits from it if you can buy it local from a farm. The reason being is that raw honey has pollen in it and every region has different types of pollen. Eating local raw honey will help build up your immunity to these types of pollen. (For more information read this article). It also has a lot of other benefits, so check it out! If you can’t find raw honey or just want to use the regular kind, that’s cool…but you are definitely missing out! 😉 This recipe makes 4 “entrée” size salads, but can easily be changed to make whatever size you like. Hmmmm…seems like I have a lot to say about “salad” this week!!! Preheat oven to 450 degrees F. Spray a glass baking dish with non-stick cooking spray. Whisk the egg, cornstarch and lemon juice in a shallow dish. In another shallow dish, combine the breadcrumbs, parsley, salt, pepper & lemon zest. Add the pecans, oregano, thyme, paprika, and cayenne. 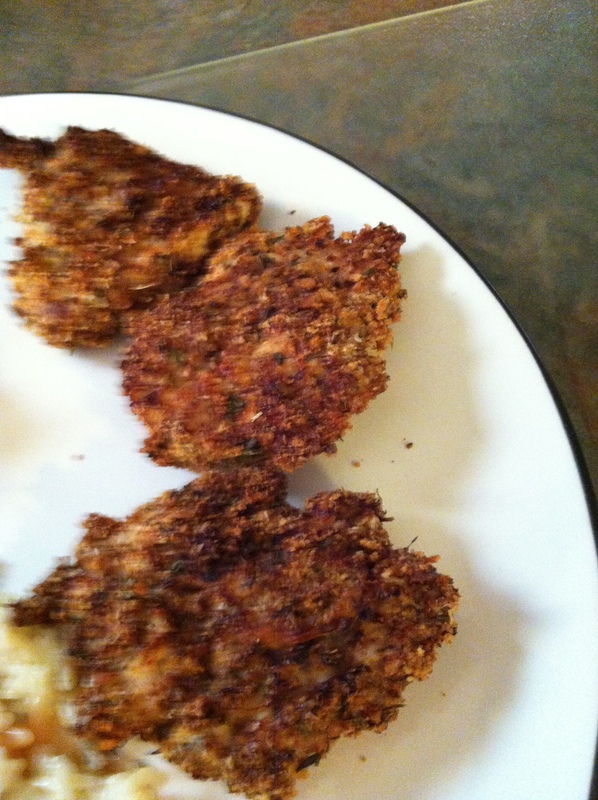 Dredge the chicken in the egg mixture then the breadcrumb mixture and place in the prepared baking dish. Bake in the preheated oven for 10-15 minutes or until the internal temperature reaches 165 degrees F.
Meanwhile, make the dressing by combining the honey, Dijon, olive oil, shallots, vinegar, lemon juice, salt, and pepper in a bowl for the dressing until blended. Toss the lettuce, onions, carrot and cheese in a large bowl. Divide salad among four plates. Slice the chicken and place on top of the lettuce. Sprinkle any toasted crumbs left in the baking dish on top of the salads.